In the largest of the Greek city, Athens to serve in the army were obliged to all citizens aged 17 to 59 years. Athens could put about 30 thousand soldiers, of whom fully operational was only half. Others (youth and veterans) carrying garrison. Hoplites were recruited from the wealthy sections of society, as the soldiers themselves provide a military equipment that could afford only wealthy people. Thyself at public expense only one whose father was killed in battle. 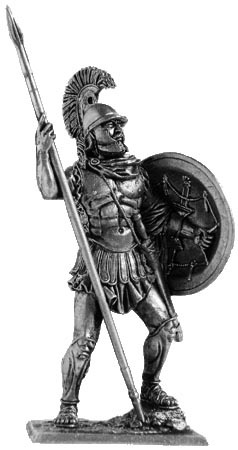 Hoplites outfit consists of a bronze anatomical shell. The front and rear plates of the cuirass reproduce muscle torso and interconnected with bronze hinges and leather straps with buckles, passed through a special ring on the side. Bottom shell supplemented pterygium from strips of leather. Legs reserved bronze anatomical Leggings, which were held on the foot through the dense tightly fit the calves. On the head - one of the many varieties of Thracian helmet, appeared at the turn of the 04/05 centuries BC Primary weapon hoplites - spear with an iron tip and an iron or bronze inflow. Sword reaches a length of 60 cm and is embedded in the wooden scabbard, decorated with leather and decorated with bronze, or bone. Argivsky wooden shield has a metal reinforced rim to resist the strongest blows. Hoplite wealthy could buy a shield with full bronze outer coating. By 4 century BC common form of decoration of the shield has an image of the initial letters of the names of cities and regions (A - Athens, A - Lacedaemon, M - Massey).